The number one question our team gets is – where are we relative to other social organizations you work with? 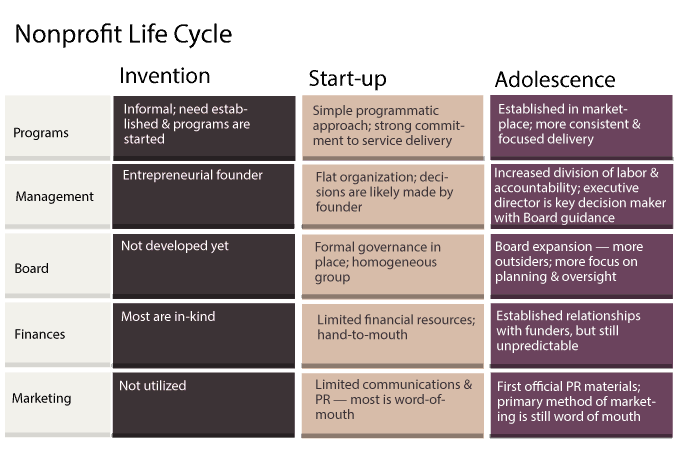 Each nonprofit is at some stage on the nonprofit life cycle. The key is not to compare your organization with others, but to contrast relative to those in your same life cycle and to chart the right growth trajectory for your organization. By completing an internal and external assessment with Social Impact Architects, you can find out where you are relative to others and determine the best and most efficient methods to achieve growth. We utilize both quantitative and qualitative research methods and provide a customized report that we can share with your staff and Board. This process is most helpful before a strategic planning process or during executive transitions.